Today am going to be doing a different kind of post. I have seen many Youtubers doing #ShopWithMe videos. So I thought of doing a similar kind of blog post. Since monsoons have started, all of you must be upgrading your skin care routines. Am sure most of you are shopping online for beauty products and cosmetics for the coming rains. So am I 😊 . 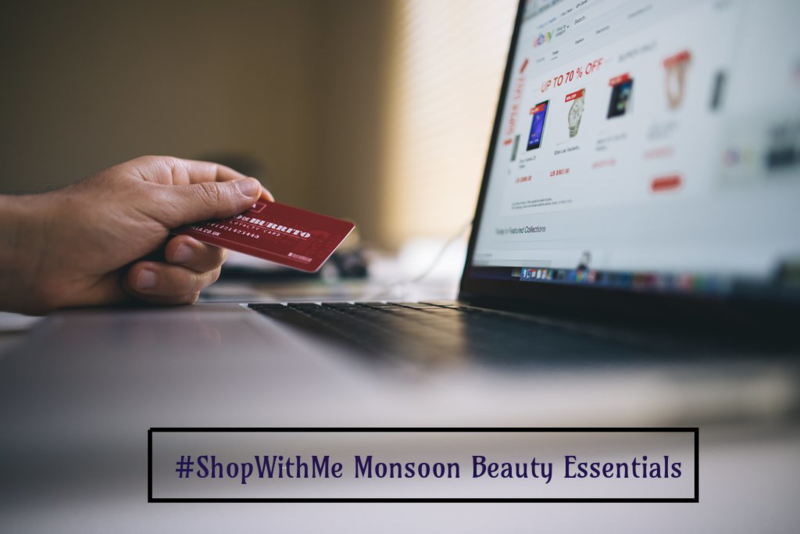 And I thought let me do a #ShopWithMe Monsoon Beauty Essentials. I hope this post with help you for online shopping India with some great recommendations for monsoons. Cleansing your face is very important in monsoons as its the time when we get lot of bacterial and fungal infections. Follow a double cleansing routine to deep cleanse your skin. I like to use a cleansing lotion followed by a face wash. Recently, I started using this Plum Hello Aloe Gentle Cleansing Lotion and its pure love. It contains real aloe juice and is free from parabens, SLS and phthalates. If you haven’t yet tried the Hello Aloe range from Plum, you should definitely check it out. After using the cleansing lotion, I like to follow up with a gentle face wash. I received this in my Reverie Box and its pure luxury in a bottle. It gives you a spa-like feeling while also gently removing impurities and dirt. Most often, at the end of summers, we realize we have tanned badly, inspite of using a sunscreen and other protection. Lotus Herbals Whiteglow Oatmeal & Yogurt Skin Whitening Scrub works brilliantly in getting rid of tan and give smooth, bright skin. And its very affordable as well. If you have oily, acne-prone skin with large pores, then this Kaya Purifying Toner is the answer to all your issues. It is milder than the Plum Green Tea one and will suit sensitive skin also. You can notice clear skin with minimized pores in just few days. Use a deep nourishing body lotion during monsoon to prevent dry, flaky skin. I love the Choco-Latte one from Plum as its paraben-free and silicone-free and smells delicious just like choco-latte 😋. After using this, I didn’t like the cocoa body lotions from Vaseline and Himalaya as I felt they were very artificial. For the body, I use this sunscreen as it has high SPF and broad spectrum protection PA++. It protects against tanning and sunburn while also nourishing the skin. You don’t need to apply a body lotion separately. If you are suffering from blemishes and scars, then try this Clinique Anti-Blemish Clarifying Lotion. It is a medicated formula which exfoliates, reduces excess oil, unclogs pores and reduces active blemishes by 37% in 3 days. Your skincare routine isn’t complete without eye care. Use a natural eye serum like the Roots & Herbs Nutmeg Brightening Under Eye Tailam which contains cold pressed oils along with ayurvedic ingredients. It helps to get rid of dark circles, puffy eyes and fine lines under the eyes – an all in one product. What’s more relaxing than a warm, relaxing oil massage when its raining outside? Try the Roots & Herbs 49 Herbs Miracle Hair Food which is a well balanced nutritious meal for the hair and scalp. It contains 49 herbs like bhringraj, hibiscus, brahmi, jatamansi, triphala, etc. It helps to strengthen hair and combat hair fall which is a common problem during monsoons. So that’s all folks! I hope my online shopping India guide for monsoon beauty essentials was helpful for you. Let me know your favorite beauty products and cosmetics for the monsoon in the comments below.